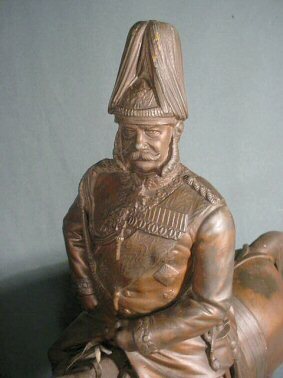 DESCRIPTION: We say �colossal� because most bronze sculptures we have seen are at best 12 to 14 inches high. This one is whopping 30 inches high and very heavy. This bronze Landseris not only commodious, but prodigiously beautiful, at the same time. 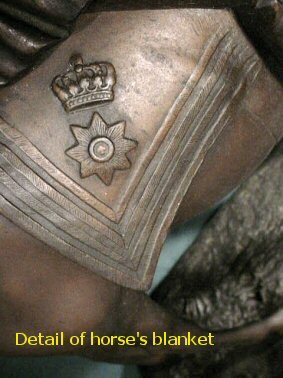 The sculpture�s application brings forth the true spirit of the German foot soldier like no other artwork we have seen to date. 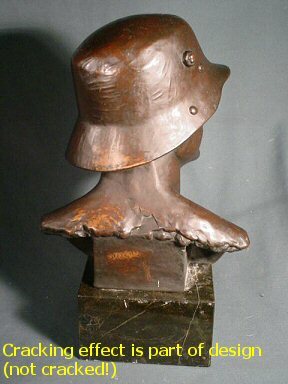 The artist (Uhlin) has transposed a mound of clay into an exceedingly outstanding consummation of artistic contribution in bronze. The figure has as equipage: field pack, trench shovel, bayonet scabbard, canteen, fur backpack, blanket roll, ammo pouches, and a Mauser-98 rifle. 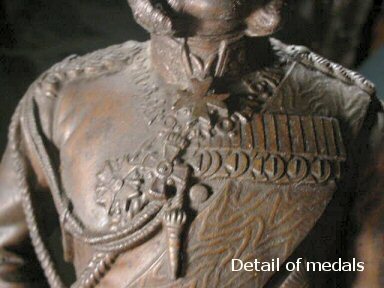 The detail is so good that even the belt buckle shows the Prussian crown, and the fasteners on the equipment straps clearly show, as well as the helmet appurtenances. This soldier could be from the Franco-Prussian War or the early stages of WWI. In any case he seems determined to fight for Kaiser und Vaterland. This is a magnificent, awesome contribution to the world of classic art. 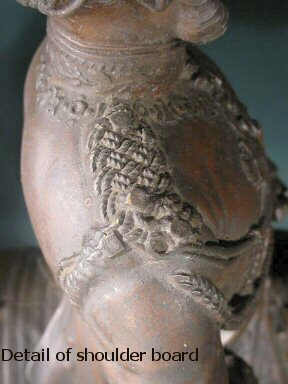 The statue shows the evidence of its age in that the patina is worn in places and the tip of the spike on the helmet is bent (but all there). In his hand probably at one time was the bayonet. That is the reason that the scabbard shown is empty. 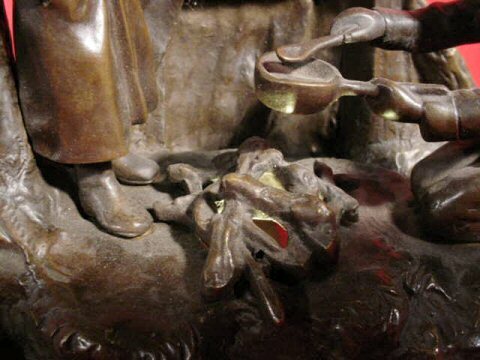 The patina can be fixed with the application of brown shoe polish (old bronze-seller�s trick). The spike can be straightened out with heat (any welding shop!). Remember, however, that this is an awesome and historically important artifact of capacious consequence and certain things must accordingly be excused. This is one to salute for sure! We have been contacted by a collector in Germany who has one for sale and we will be able to (UP TO SOME POINT) procure another one almost exatly the same, for an interested client. DESCRIPTION: Now let's speak of "unusual." 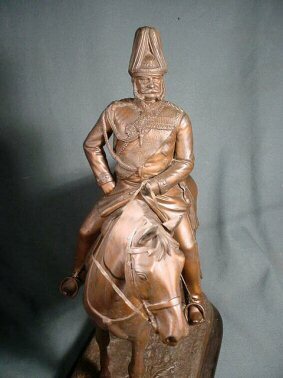 Here is one of the greatest Imperial art pieces that we have ever seen. 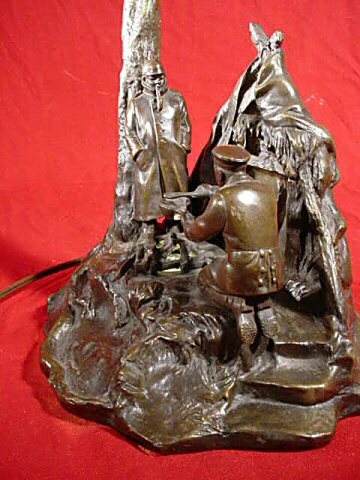 It is a fine lamp all crafted in bronze that depicts two German landsers at R&R at the front. One in Pickelhaube (helmet) rests against the tree, which is the lamp stem, while smoking his pipe, while the other kneels while starting up early-morning breakfast. Under the lamp base is another light socket that when lit illuminates the wood fire that "Fritz" is using to heat his frying pan. It is so realistic that the light from the "fire" reflects boldly on the bottom of the pan. Talk about art copying life! In the background is a pitched tent. The roots and bark of the tree are done to spectacular lifelike detail. Although unsigned, the work is similar to Karl Kauba, born in Vienna in 1865; died there in 1922. 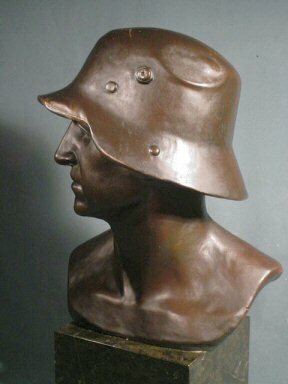 He signed his German subject works "Karl" and when he sculpted cowboys or American Indians he signed "Carl." However, not all of his art pieces are signed. He, like Adolf Hitler, was inspired by the pot-burner stories of Karl May and his old shatterhand legends and he also worked form photographs of the American West. This may very well be a Kauba creation, but regardless, it is definitely an unusual and elegant object d'art of significant importance. It measures 20 inches high , but the tree, if it did not bend at the top would be possibly 25 inches to its branch tips. The base is about 9 � inches in diameter. The standing soldier is about 4 � inches high. The lamp shade is a beautiful translucent, tulip shape that gives morning time glamour to the subject below. 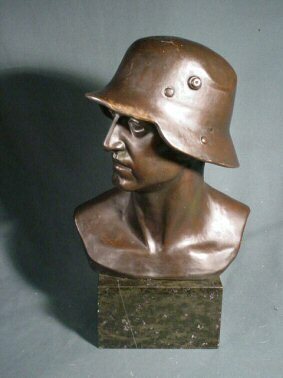 This is a wonderful art sculpture and a great centerpiece for a German military collection. 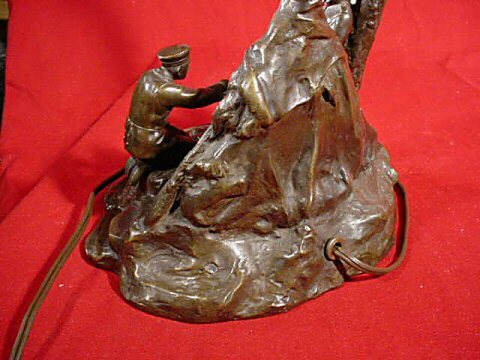 The collector of bronze art pieces would be proud to add this wonderful vision of military life at the front to his or her collection. 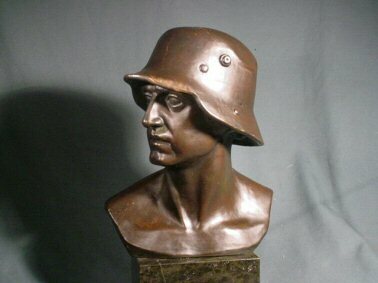 DESCRIPTION: This is a very highly dramatic bronze sculpture of a German Landser with WWI helmet. This is the classic pose of der Helden (the hero). It was customary to depict him bare-shouldered in the classical Greek statuary form. These sculptures were in high visibility at Wehrmacht Kasserne and Waffen- barracks throughout the Reich in the 1930's and 1940's. There is some damage from rough GI handling. 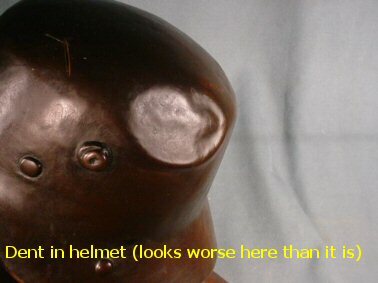 We have shown the bayonet slash and the dent on the helmet's surface in the pictures. They are there; placed by some other hero!! !, but they really don't detract that much from the overall sheer militant beauty of this historic treasure. No signature is evident. 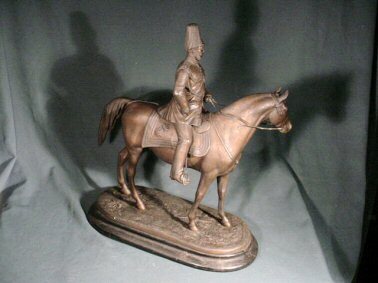 This is a large and heavy bronze measuring 19 inches tall including the marble base. From shoulder to shoulder measures about 10 inches. From the brim to the back of the helmet base measures about 7 x 5 inches. 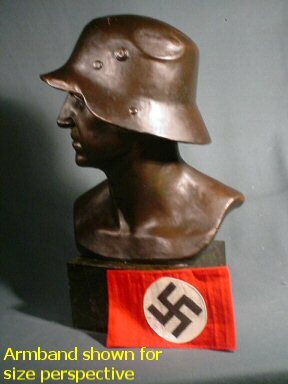 This is a seldom-seen trophy of the "brother wars" that have unfortunately beset our century and today are a continuum! The NSDAP armband is placed for viewer's size perspective. 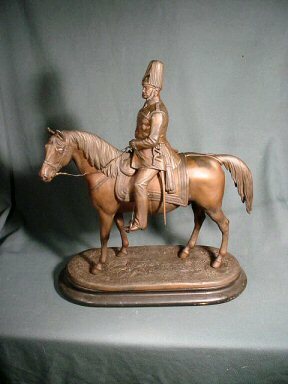 DESCRIPTION: This is probably one of the finest and detailed sculptures of the Kaiser periods. The best we have even seen! The detailed features are quite phenomenal. 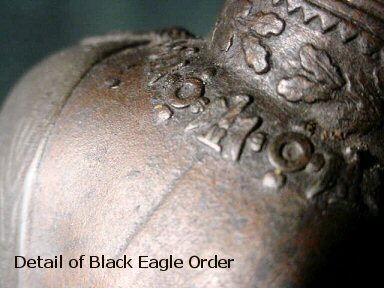 Look to the pictures: The detail is so good that even the Prussian eagles that are the appurtenances of "the Black Eagle Order" around his collar are clearly defined. Every medal, every lanyard, tip, the helmet insignia, the bullion items, all stand out in brilliant, fantastic dimension and clarity. 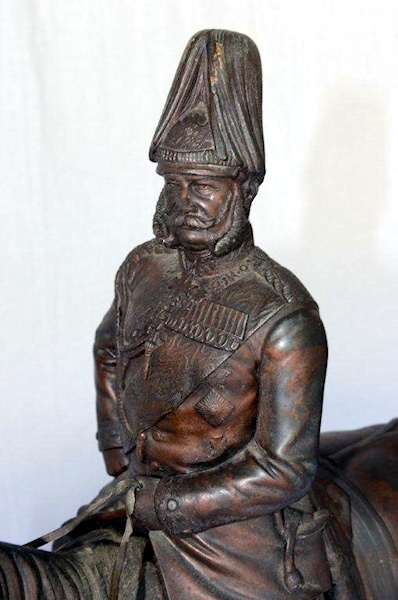 This sculpture, probably executed in the 1880's, is in pristine-perfect condition with a small incidence of blackening and minimal corrosion here and there. (It's more than 114 years old!) It is literally nothing short of gorgeous! You would naturally think that at least the sword scabbard at his side would have been broken and long gone, but it clearly is there and never broken or replaced. 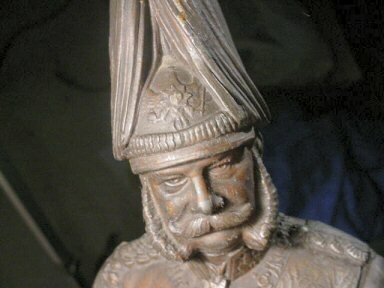 This is a very dramatic pose of the German Warrior King of Prussia. 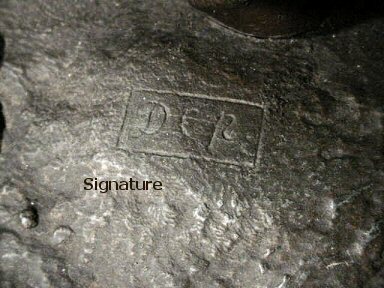 The sculpture bears an initialed signature that looks to be "DEP" with a rectangle form around it. The artist was obviously so well know that this initialed motif was all that was needed to identify him. Emperor Wilhelm I Hohenzollern was born March 22, 1797 and died March 9, 1888. Certainly he was the boldest, but most beloved of the German monarchs. 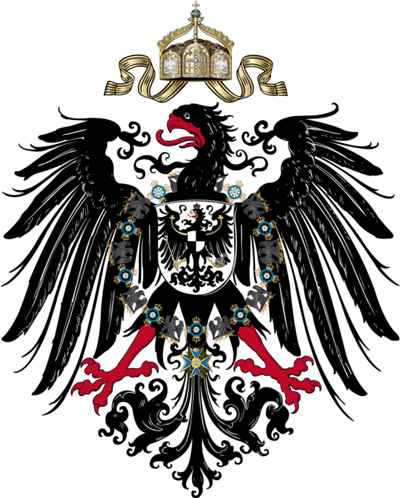 He was the German Emperor and the King of Prussia. He was called the Warrior King because of his personal front-line participation in the Franco-Prussian War, which resulted in the devastating victory over France in 1871. 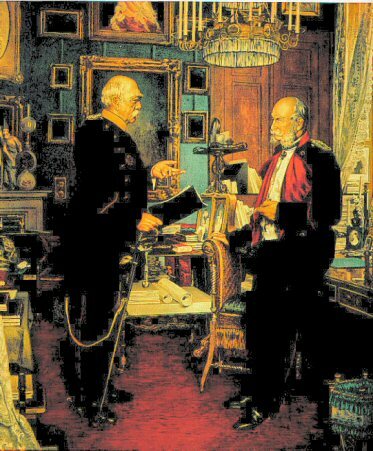 Wilhelm I was proclaimed German Emperor on January 18, 1871, in Versailles at the palace of Louis XIV. This was the result of not only the victory of Germanic arms, but in the spirit of true German unity not experienced since the year 9 BC, when Hermann, the warrior chief of the Cheruscans, brought together the former warring tribes to soundly defeat the Roman legions. Wilhelm became the living symbol of a reborn German unity and the general public loved him; however, his successful militarism plus his belief in a divine right brought fierce resentment from the usual filthy rag-tag radicals straight from the sewers of Berlin. In fact, two attempts on his life were made by these dirt bags. 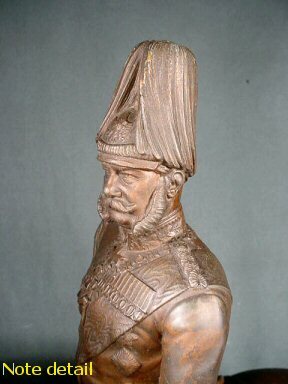 Prince Otto Leopold von Bismarck, 1815-1898, was his staunch ally, but Wilhelm often disagreed with his "Iron Chancellor;" however, he was usually persuaded to go along with this convincing paladin of the Reich. 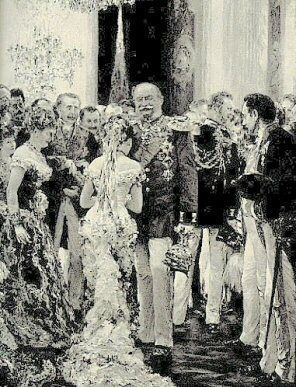 Wilhelm I died in 1888, leaving a crucial impact and impression on 19th-century Europe. 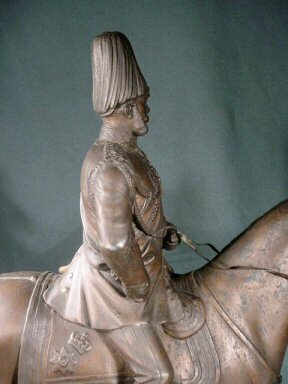 Although this sculpture is extremely fine and extremely rare, it is also of monumental proportion among such statuary of the Kaiserzeit. From the base to the top of the helmet measures 20 � inches. From the horse's snout to the tail it measure about 20 inches. 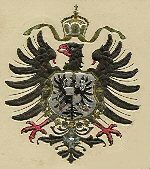 The most important thing to note is that it is so perfect it certainly would make a very exciting and dramatic addition to any good Imperial German collection of note.